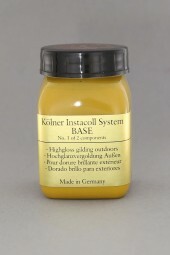 Kölner Instacoll Base Yellow | Instacoll | Gold & Gilding Materials | Kremer Pigments Inc.
S20: When using do not eat or drink. S21: When using do not smoke. The system consists of 2 components: Base (#98157) and Activator (#98156). The Base is applied with a special Kölner synthetic brush or a spray application. After the base layer has dried, which can last up to 1 hour, it is possible to gild for 1 hour. For a longer lasting or later gilding, the surface can be reactivated with the Activator. The Activator should be applied in a very thin layer, so that the surface is reactivated again for the metal adhesion. That Activation can still be applied or repeated after a long time. The Activation is dry after a few minutes. Thereafter, the treated surface is receptive for gold leaf for at least 1 hour. The adhesion occurs through pressure. 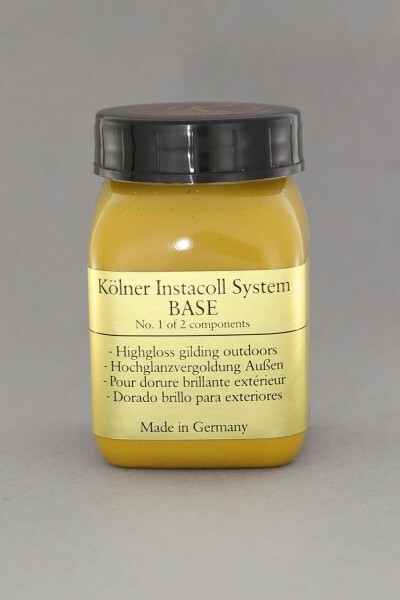 Customer evaluation for "Kölner Instacoll Base Yellow"